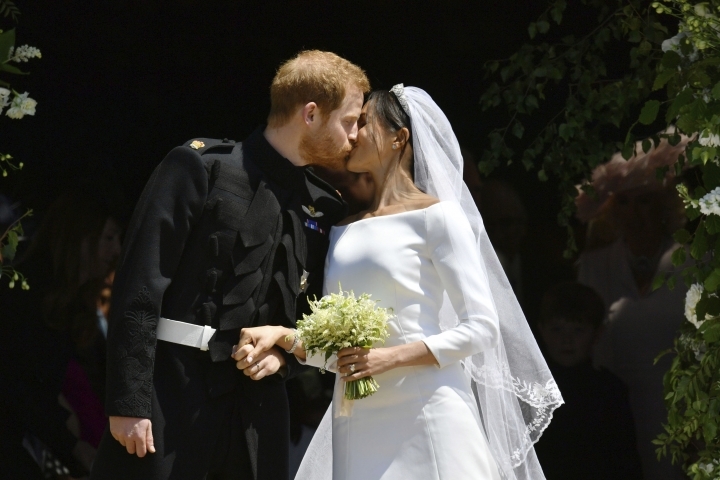 LONDON — It's an old tradition that a bride should have something old, something new, something borrowed and something blue on her wedding day, and the Duchess of Sussex followed at least part of that when she married Prince Harry. The former Meghan Markle has revealed in a television documentary that she had a piece of blue fabric from the dress she wore on her first date with Harry sewn into her wedding dress. She made the comments while discussing the dress in a documentary about Queen Elizabeth II called "Queen of the World." She didn't say whether she also embraced the rest of the tradition. The clip was made public Sunday. The documentary will be broadcast at a later date. It deals with the queen's role as head of the Commonwealth. The duchess described her May wedding on the grounds of Windsor Castle as a "magical day." The American actress who starred in "Suits" married Harry on May 19 on the grounds of Windsor Castle. The "Queen of the World" will air in the U.K. on Tuesday. Time To Visit There is a travel site that just wants you to take the time off and leave to your getaway destination without delaying the trip any longer. Copyright © 2015 - 2019 Time To Visit Here. All Rights Reserved.